Television is the best friend for homemakers. It helps them beat the boredom of being alone especially when there is no one to give them company at home. With the passing time, the content on TV grew multi-fold and now people have many options to choose. This leads to people developing preferences when it comes to watching content on TV, especially TV shows. When it comes to Tamil, it is the same case. 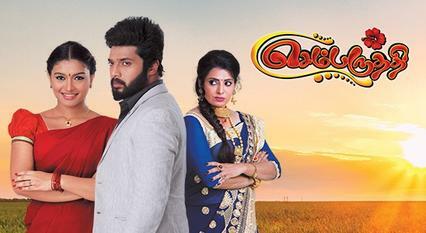 While there are many shows on-air, one show that has been really catching people’s attention is Sembaruthi. This is one of the programs among many which has managed to strike the chord among its viewers by invoking interest with each episode as it combines various aspects like Love, Thrill, Suspense, Hatred and Treachery among others. Airing at 9 PM on weekdays, Sembaruthi is about how Akilandeshwari – played by Priya Raman is proud about her wealth and what happens when her own son Aditya (played by Karthik Raj) falls in love with a poor girl who comes to work in their house as a servant maid. Parvathi (portrayed by Shabana), the maid through her kindness and good behaviour makes Aditya fall for her and what follows, forms the rest of the story. The show marks the comeback of Karthik Raj after 2 years to the small screen. concluded “Zee Kudumbam Awards 2018” for Favorite Dad (portrayed by Dad Sundaram, Priya Raman for her exceptional acting as Akilandeshwari, Vanaja for her villain role, Kathir(Adithya’s brother Arun) has won the best supporting actor, Favorite Serial Award, Adhitya and Parvathi for Best Pair and also for Best Hero and Best Hero Awards being bagged by Karthik and Parvathy). But let’s focus on a common problem that many TV viewers face. There is a specific timing assigned to each program and Sembaruthi is no exception to this rule. Usually, programs are assigned timings based on their popularity. The more the popularity, there are more likely chances for the program to be aired in the evening beginning from 7 PM and goes all the way up to 11 PM. various circumstances like preparing food, spending time with the family, going for an outing, attending a function to name a few. some other day/time. This is acceptable only if happens once in a while. When you miss episodes on a regular basis, you tend to lose interest over the program since there is no continuity. The Continuity factor is the major aspect that would decide your loyalty and interest towards a program. But is there a way to address this concern? with family members quarrelling to watch their favourite program. authority over the usage. The best part - It doesn’t cost a bomb. For Rs.49 per month, you can watch all the latest Tamil movies, Live TV and ZEE Tamil shows online.